In the picture above is 36 inch chess set. 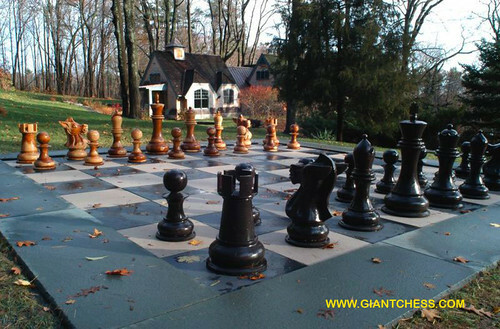 Perfect for outdoor chess game and can use by all ages. The playing surface for this chess set is a chessboard with 18" x 18" squares, and is highly suited to being played by adults in various outdoor settings, and for many different occasions. Although the pieces are quite heavy, and are not easily transportable, they can be easily shifted across the squares of the board in actual play. Those chess pieces and board have made from best quality of Teak wood. Polished well in brown and black, add with glossy touch. Very durable product for outdoor use, so you can left it at your garden or backyard for months. Those are durable in any seasons and weathers. Just order it now and we will give you the best product.